When Nintendo asked players to vote between Callie and Marie in 2015's Splatfest, few Splatoon players would have guessed that the final decision would exert direct influence over the plot for Splatoon 2. Well, surprise — that's exactly what happened. In a strange turn of events, Nintendo used social engagement to influence the future of the Squid Sisters, the original Splatoon's biggest characters, and now that players have dived headfirst into Splatoon 2, many are left wondering just what happened between Marie and Callie. Fortunately, we've got a concise synopsis of all of the events leading up to Splatoon 2, as well as a summary of the major events of Splatoon 2, featured below. The following is a summary of the events between Splatoon and Splatoon 2, as initially presented over on Nintendo's prologue page for Splatoon 2. The page is an interested read in itself, providing some color for everything leading up to the immediate plotline of Splatoon 2, but for those readers keen on the essentials, we've got the highlights featured below. Be forewarned — spoilers for the game's plot follow, specifically after the ending of our prologue section, where we actively discuss Splatoon 2's in-game events up to and including the game's ending. The tale of the Squid Sisters begins: "The showdown of Callie versus Marie ended in victory for Marie, but there was no ill will between the two. The girls left the studio arm in arm, smiling and laughing as they always had. The bond between them would continue, unbroken, for years to come. 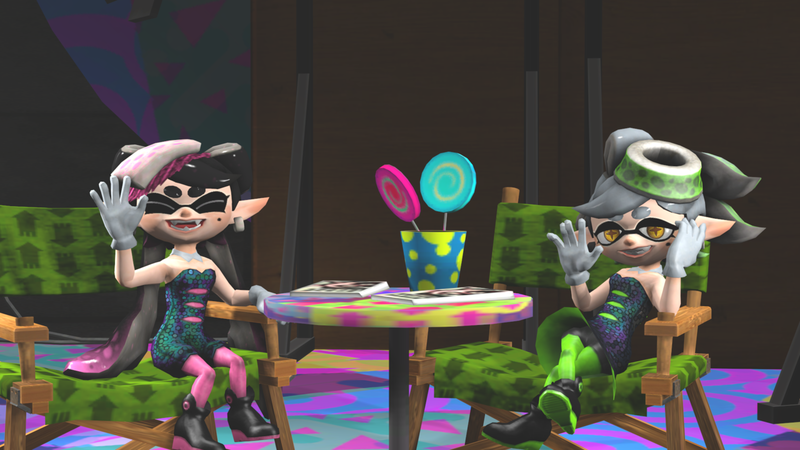 Or so it seemed at the time..."
After the events of the final Splatfest (from the first Splatoon), Callie and Marie went on to rent an apartment together in Inkopolis, working and spending their leisure time together, only to see a divide slowly grow between two due to their separate careers. Callie would take on solo appearances at various television shows, while Marie would go on to perform solo musical concerts without her friend. As Callie stayed busy with her solo ventures, Marie would find herself taking up household chores, wondering when her and her best friend could return to the lifestyle they enjoyed before the first Splatfest ended. On a day when all seemed well, Marie spoke to Callie of her plans to take a trip back home to Calamari County. After being offered an invitation, however, Callie stated that she couldn't join until until a day later. Arriving at home, Marie's parents worsened her worries by constantly asking about Callie, making Marie realize that she really had grown apart from her one-time best friend. After that first day back home had ended, Marie headed down to the local train station, eagerly awating her friend to join her. When the train pulled up, though, Callie was not on board. Marie even waited for the next train to no avail — Callie simply didn't show up. After placing a number of calls and speaking to local citizens, Marie couldn't track down her friend, and she begin to have an inkling suspicion that something was amiss. Unable to wait any longer, Marie cut her vacation short and got the first trip back to Inkopolis. Upon arriving at her apartment, Callie was nowhere to be found. Even worse, there was no sign that Callie had been home at all in the day since Marie left Inkopolis. With growing suspicions, Marie took a desperate trip out to Octo Valley to speak with Cap'n Cuttlefish, only to discover the city abuzz with news that The Great Zapfish had disappeared. Concerned about her friend as well as the lives of local citizens, Marie began to put together a team to investigate the Octarian menace. Marie would eventually enlist the services of Agent 4, the strapping young Inkling that players assume control of within Splatoon 2. Agent 4, alongside weapons guru Sheldon, is tasked with exploring and splatting their way through Octo Canyon, fighting off the vicious Octarians in an attempt to recover each of the stolen Zapfish. Eventually and inevitably, Agent 4's quest brings them to encounter none other than the missing Squid Sister Callie. Callie has been holed up in Octo Canyon, ignoring her friends and loved ones and using her immense prowess toward evil means, as it seems she's inexplicably aligned with the Octarian cause. Not only does she appear to have had a serious change of heart, she's also had a serious change in wardrobe, dressing in dark colors and sporting a pair of 80s-spectacular sunglasses. 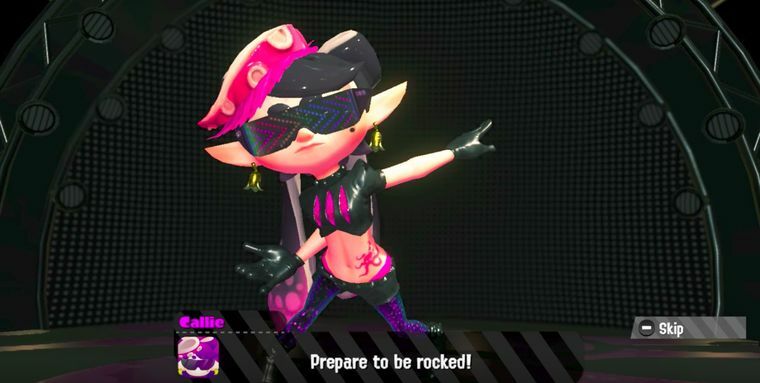 Fortunately, Callie hasn't actually become evil -- the sunglasses she's wearing were placed there by DJ Octavio, a ne'er-do-well players will remember from the events of the original Splatoon. The glasses provide a form of mind control, and together with Callie, DJ Octavio jumps into control of the Octobot King II machine in an attempt to destroy Agent 4. Fortunately, before the machine can wreak too much havoc, Marie shows up and manages to shoot off Callie's mind-controlling sunglasses. Reunited on stage, Marie and Callie give a performance that propels Agent 4 toward victory. Once DJ Octavio falls and the Octobot is destroyed, the team is finally able to recover the Great Zapfish. And, with the Octarian menace laid to rest once more, Marie and Callie are able to set aside their differences and reunite as friends once more. 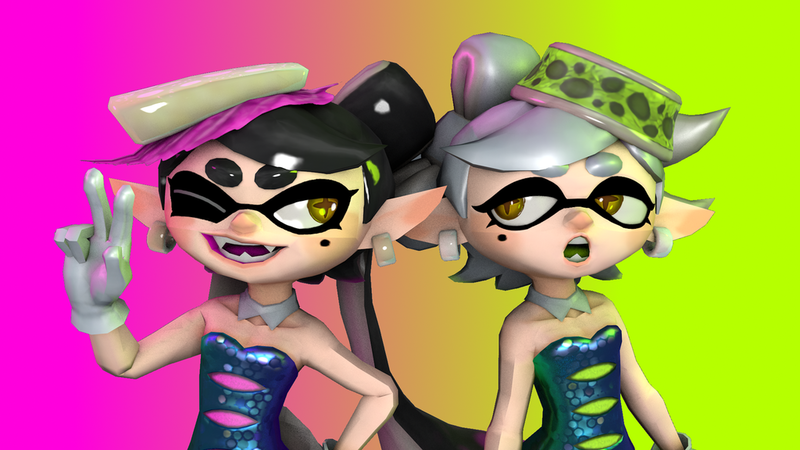 Reclaiming the title of the Squid Sisters, the two triumphantly reignite their shared musical career. Now that you're all caught up on Splatoon 2's story, try checking out our Splatoon 2 guide hub, where we've featured everything players need in order to track down all of the game's Hero weapons, Sardinium, and more.